The resurgence of political economy as an important topic reflects the deep interpenetration of politics and economics. There are few economic issues of consequence that are not shaped by government decisions, and there are few governments whose agendas are not dominated by economic issues. No country reflects the interpenetration of politics and economics as much as Israel.In this analysis, Ira Sharkansky examines the extensive involvement of the Israeli government in the country's economy, reflected in governmental expenditures that exceed the gross national product, intimate links between governmental activity and Israeli's standard of living, high inflation and other economic problems, and policymaking behaviors that include entrepreneurialism and indirection. He explores the strategic points of Israel's political economy, pursuing a qualitative analysis of Israeli problems and strategies for dealing with them. 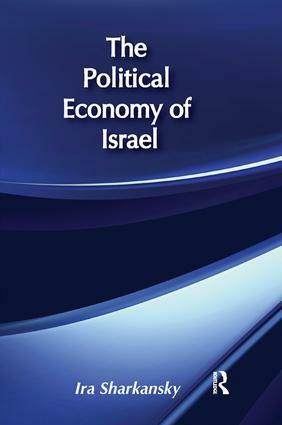 Those interested in policy analysis, political economy, comparative politics, comparative public administration, and Israeli politics will find this book invaluable.Contents: The Political Economy of Israel; What is the Israeli State? How Large is the Government Budget? ; Israel's Standard of Living; Israeli Municipalities: Local Initiative amidst Central Controls; Who Gets What amidst High Inflation? Winners and Losers in the Israeli Budget 1978-1984; Conundrums of Israel's Political Economy: Problems without Solutions; Public Sector Entrepreneurialism; Policymaking by Indirection; Perspective on Israel's Political Economy. Israel's Bizarre Public Finance: Governmental and Quasi-Governmental Bodies That Spend More Than 100 Percent of Gross National Product!